The product is suitable for music game"POPSTAR GUITAR" to play. It has a good handle, and use convenience. 1, Take the product into Wii controller to use, please check the pic. The product is suitable for music game"POPSTAR GUITAR" to play. It has a good handle, and use convenience. 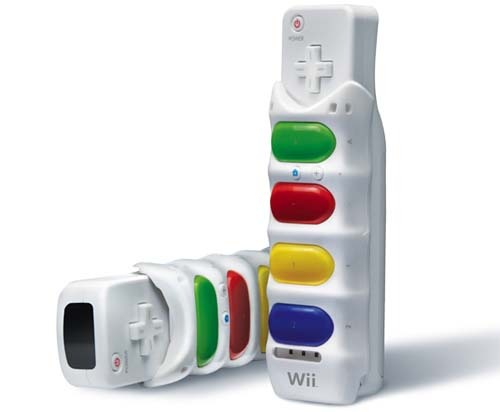 1, Take the product into Wii controller to use, please check the pic. 2, Insert "Left controller" into "Main controller port". 3, Please press same color key-press to activate note when playing. 4, Please discharge bottom from side carefully when dismounting. 1, Please cover the product match well when using. 2, Please don't use much power to discharging the product.